Enter the channel number in the edit, 1 for MONO, 2 for STEREO. Enter the samplerate in this edit (it won't affect the playback samplerate). Enter the length in seconds of the file to be created in this field. 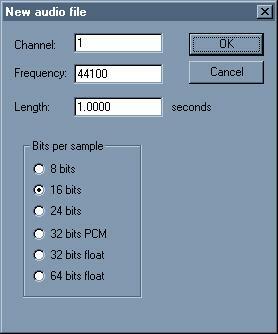 Select the bit depth of the file to be created.